Often it’s the attention to small details that makes fine craftsmanship stand out. If you want to build a utilitarian table, bench, or shelf, there are plenty of ways to do it without going to the trouble of making it pleasing to the eye. But sometimes we’d like to build something that will be at home in living spaces and not just our workshops. It’s true that what belongs in living spaces can change significantly with one’s marital status, so before your 2×4 and plywood dinner table gets the curbside treatment, it’s time to hone your woodworking skills. We can easily add form to function with a band saw and before you know it, we can have a piece that looks good and works well. Corbels are a simple way to accomplish this. They can adorn and hold up a shelf, become part of a table frame, or even class up the upper corners of entryways. 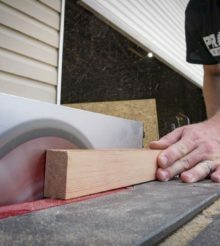 Here’s how to cut corbels on a band saw. This article almost wasn’t written. We’re still not sure it’s a good idea but in the interest of full disclosure, we have to confess the following details. We thought that the great, wide internet must have a place where we could download printable corbel templates. Well, we were right. What we didn’t anticipate is that the best place to find them was on Pinterest, and to access them we had to set up an account. So a Pro Tool Reviews member who will remain nameless took one for the team and signed up. He’s not particularly proud but he can download lots of corbel templates and tell you how to make your own laundry detergent. Anyway, that was cathartic. We traced out the corbel design. We cut the stock down to a manageable size using the DeWalt DWE7499 you might have seen in our tablesaw shootout. If you have a full-size band saw with an extended table you may not need to do this, although it certainly makes the cut easier if you do. Plus hey, more tools. For this article, we used Ryobi’s value-minded 9-inch model. The not-so-secret secret to band saw curves is relief cuts. These are cuts you make before you start the outline of the corbel. As you cut the corbel, the relief cuts that you made allows waste material to break away. This gives you greater area to move the stock without twisting the blade. It also allows greater cut accuracy as it’s easier to keep the blade on the outline. Take your time with relief cuts. They are useless if they are too shallow and never meet the outline, but they will damage the corbel if they are too deep. The blade is spinning so quickly that you see the solid part of it but not the teeth, so it’s easy to go too far. Smaller relief cuts may generate small wood bits that get stuck between the table and blade. These remnants may in turn impede the your work piece. Do not try to get fancy and remove the bit while the blade is spinning. Turn off the power, wait for the blade to stop, and then remove the piece from behind the teeth. There is a way to avoid this that we’ll cover in another article. Once you’ve cut out one corbel, you can use it to trace the rest. Sanding the rough spots and easing the edges will require some time, but it will put the finishing touch on a nice new piece. We hope you’ve learned how to cut corbels on a band saw. If you’re a Pro and you have carpentry tips to pass on, add them in the comments below or sound of on Facebook, Instagram, and Twitter!